The 38-year-old Puerto Rican Broadway composer, lyricist, playwright, singer and actor has released One Last Time (44 Remix), a gospel version of a song from his Tony Award-winning musical Hamilton. He is joined halfway through by former President Barack Obama– the US’ 44th president – who delivers part of George Washington’s farewell address during a guitar and piano interlude. Miranda also posted a picture on Twitter of the former president casually hanging out in the studio. 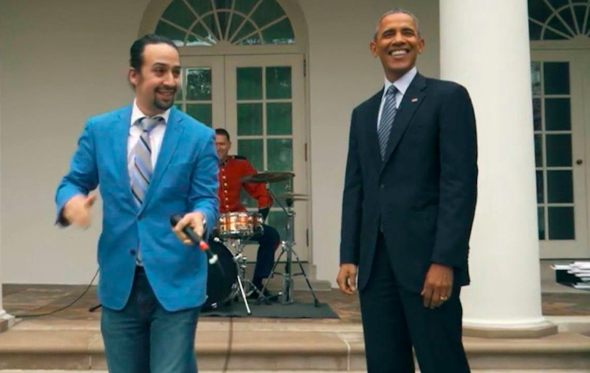 The Obama reworking is the final drop in Miranda’s “Hamildrops” series of tracks, which feature new versions of his songs. Most have been used for charity fundraisers. Obama and Miranda have teamed before on visits to the White House, and Miranda admits that One Last Time was inspired by Obama reading over Will.i.am’s Yes We Can, which featured an Obama speech backed by acoustic guitar.